p u r s l a n e . . .
A half-hardy annual with fleshy, slightly crunchy, succulent leaves. 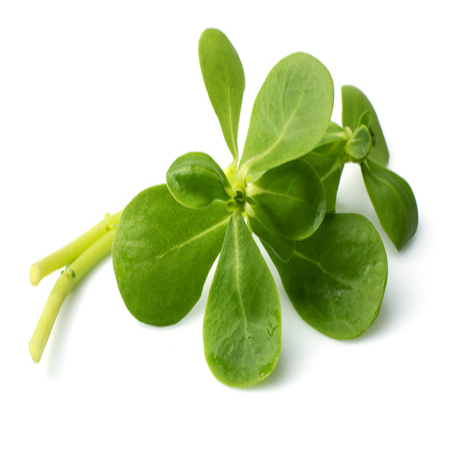 Summer purslane is fairly high in omega-3 fatty acids. Sow: Sow your purslane seeds direct where they are to grow, in a sunny position, from March to July. Aftercare: Thin to 10cm apart and water well. Purslane grows very rapidly and, although low lying initially, will eventually grow upright. Harvest: Pick the younger, more tender looking leaves as required and remove the small yellow flowers as they appear to prevent the leaves acquiring a bitter taste. Add the crispy leaves, which have a slight nutty and peppery flavour, to salads, sandwiches, soups, stir fries and stews. They are nutricious and fairly rich in omega 3 fatty acids, providing health benefits to vegetarians in particular.